Brett Rutecky » How to find social media clients. Several people who use my Tab Engine Facebook app service have asked how they can find more social media clients. Because of this I decided to do a general article on ways to find and acquire social media customers. Even if you use one of my competitors and are not a Tab Engine customer you can still use these tips to increase your client base. The first thing to do before you even think about contacting clients is to decide what services you are going to offer. Tab Engine and most of the other Facebook app services includes a lot of different tools for fan page owners. Are you going to be a ‘Facebook ad manager’? Are you going to ‘increase page likes’? Are you going to get your clients more customers through deals, coupons, and specials? Are you going to take control of everything and be a full service social media management firm? I suggest you set up a few different ‘package levels’ with different offerings and different price points. Something to keep in mind though. Your clients will want one thing from you, more customers. They will want to see a return on their social media investment. If you can deliver this then you will have earned a long term client. One of the best and most easy ways is to use Google to find customers. Below is a search string that you can enter into Google that will bring up a list of fan pages for a specific business. 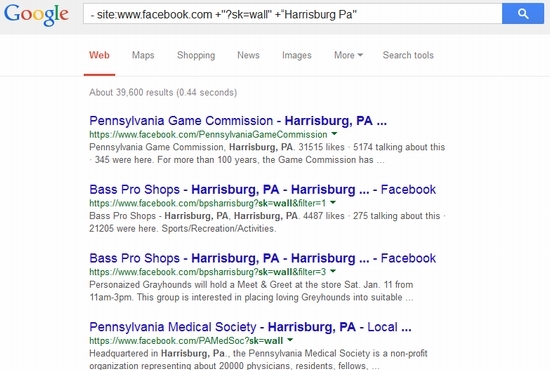 The result is a list of thousands of fan pages in the Harrisburg Pa area. So now you have a nice list of local business’s that you can contact and try to make them your customers. But how do you contact them? Simple. From the Google search results right click on the fan pages that are found and select ‘Open in new tab”. This will let you go to the fan page itself without loosing your search results. Once you are on the fan page you can not only assess the need for your services but you can also message the fan page owner. Also since this is a business fan page you can also normally get all their local contact information such as street address and phone number. Ok so now you have a list of potential customers for your social media business, you have a link to their fan page, and likely their address and phone number. So what do you do next? The most obvouse thing is to post a message to the fan page owner. The thing to keep in mind though is that most small business owners are not going to be very active personally on their fan page. They have a business to run after all. (which is why they need you) Because of this posting a message to the Facebook fan page is not going to be the best way of contacting them. You should still post a message to the fan page since its free, but understand that this is not the most effective method. The best thing, that will bring the most results, is going to be to do a little foot work. That is contact them directly. To start with you should have a generic letter giving an overview of your company, your services and the benefits of your services. Get their address off of their fan page and send them the letter as a way to introduce yourself to them. After a few days pick up the phone and call them. The point of this call is not to try to sell them anything. Its to try and get a face to face meeting with them. You may have to call a couple of times in order to speak to the ‘decision maker’ but be persistent. Tell them that you just want 5 minutes of their time to show them how you can bring them more customers through social media. Finally after you get the face to face meeting with them you can give them your pitch. When doing your pitch keep it short and to the point. These people have a business to run. What this means is that they will almost always be very busy and have little patience for nonsense. When giving your pitch you should highlight on a few things. A) How you plan on using social media to increase their sales / customers. For example you might suggest that a Pizza shop runs a contest that gives away a free pie in order to collect email address’s that you can then send weekly specials to. Or you might suggest that a barber gives a ‘guys special’ coupon. Where dad comes in for a cut and gets a free one for his son as well. When suggesting contests or sweepstakes make sure you point out that giving a little bit of a discount now can bring them dozens of long term customers. B) Why social media is better than other advertising platforms. For example you might point out that social media will let their ad dollars target people who are likely potential customers, unlike radio or newspaper ads where they pay for the ad to be presented to everyone, including people who are not their target audience. Point out that this is a more efficient form of advertising that gets them a higher ROI from their ad investment. While it is likely you will do all the leg work yourself at first, at some point you may want to expand. One of the first ways to expand will be to get someone else to do the cold calling for you. To do this simply post an ad on Craigs List. The ad should be a help wanted ad for an ‘appointment setter’. Pitch it as a ‘work from home’ job where you pay per appointment. By paying per appointment the job becomes a result based one which does not require you to watch over the person doing the work since you only pay for results they produce. Finally after you really get going your going to want to have other sales persons to go to the appointments for you. At this point you will likely have an office and have people in house doing appointment setting. While it will take some work and persistence to go from just you in your home to having an office with appointment setters and sales people I know for sure that this is possible. I have seen it done before. Even if you dont want to get to the point where you have employees and appointment setters and other sales persons you can still make a nice side income by providing real and true value to local social media clients. Excellent advice, Brett. I’ll also point out that it is possible to change your script to search for specific professions ie. Dentists as well. Very, very helpful. Thanks for this post. This amazing free article could have easily a paid wso. Thanks Brett for providing us with such a great value.